It's time to put seats in the Corvette. But which ones? I posted earlier that I had sold the Poorvair and would use some of the funds to spruce up my ratty Corvette. Step one will be to replace the cracked and shredded seats currently in the car. Interestingly, for me in Canada, all three of my options cost just about $900 each. So the choice is down to preference, not cost. Option #1 is to re-foam and re-cover the originals. The stock seats look nice but have zero lateral support which means I slide around everywhere while driving it. 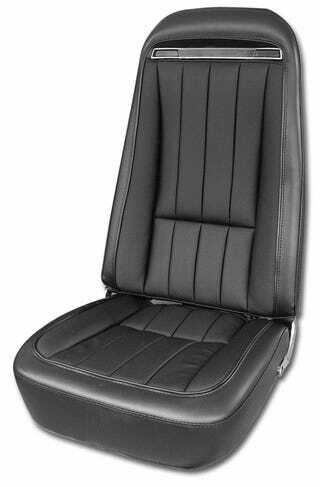 Option #2 is the cool Corbeau Classic bucket seat. I like that it uses the same vertical stitching motif as the original but provides much more bolstering for corners. Once I remove the headrests, they’ll look like period pieces to. Downsides are possibly too wide for the skinny Corvette and they don’t fold forward so I can’t access my behind-the-seats-cargo-area very easily with these. Option #3 is just a little more crazy with these Corbeau GT4 seats. I love the GT40 and 911R vibes with these and they’re really close to a real period racing seat. Not sure if the buttons will “go” with my interior or maybe feel a little incongruous with the rest of the car. But I like them. What do you guys think? Option 1, 2, or 3? I’m very determined to keep the seats retro looking so I have zero interest in a modern high-back seat.